You are here: Home / Blog / How-To / Are You Dedicated in Practice? Almost by definition, yoga is limitless. Yoga helps us live more skillfully in the world and ultimately, move beyond the constraints of an embodied life. From that perspective, all life experience is an opportunity to practice a yogic lifestyle and mindset. The art of a yogic life begins when we roll up the mat or get off of the cushion. Formal practice is a bridge into the true test of our day to day interactions. Generally speaking, the more we apply ourselves to dedicated, regular practice the more integrated our life becomes and we experience a greater degree of fulfillment. Magic! However, it is not always so simple. Life circumstances and distracting habits can undermine our ability to practice. It’s easy to get “caught up”. No matter how distracting our circumstances may have become, the spirit and promise of yoga is still there, patiently waiting. It’s like the sun, who continues to shine regardless of how thick the clouds may be. Baba Hari Dass, one of my primary teachers, stated that sadhana (one’s dedicated spiritual practice) is a “duty”. From this perspective, yoga is less about a positive emotional experience as it is about being inwardly resourced so that we can tend to all of our life-responsibilities from a place of balance, dedication and aliveness. He emphasized being committed to the process more so than attachment to the fruits of our efforts. Yoga is more like a marathon than a sprint race -it takes time to mature in the practice. And like any discipline the more we practice the more adept we become. Consistency is the key. This equation becomes remarkably simple when we commit to practicing, no matter how small, every day. This approach will completely eliminate “tomorrow syndrome” and build momentum over time. Admittedly, there are days when I feel less inclined to practice, days when the warmth of my sheets starts to overshadow my desire to be my best self. It is in these moments I give myself a nudge by simply reminding myself that I will be much better off for having practiced, that “I will be glad I did it”. Oftentimes it is the first few steps that are the most difficult and a sense of appreciation soon sets in, having surmounted the proverbial “mind over mattress”. The next step to get to the sink and splash some cold water on my face. Works every time! Getting outside support is beneficial for seasoned practitioners and beginners alike. Support can look a lot of different ways though ideally it entails being in the physical presence of an adept teacher with whom you resonate. There you will also find and receive the support of fellow and kindred yogis who are also on the path. Ideally, this happens as frequently as possible. For those who have an established home sadhana practice, and for whom their teacher lives far away, this could look like making the trip once every six months. Of course, the proliferation of yoga studios also makes attending a regular class very accessible. Or consider enrolling in a more advanced workshop, retreat or committing to an extended training. Yoga, by its very nature, is intended to help us live more embodied lives and propels us to be the best version of ourselves. Of course, the path is rarely a straight line as we traverse the varied landscape of our lives. Regular practice with the support of community is the means by which we mature as yogis and bring the teachings into our everyday lives. 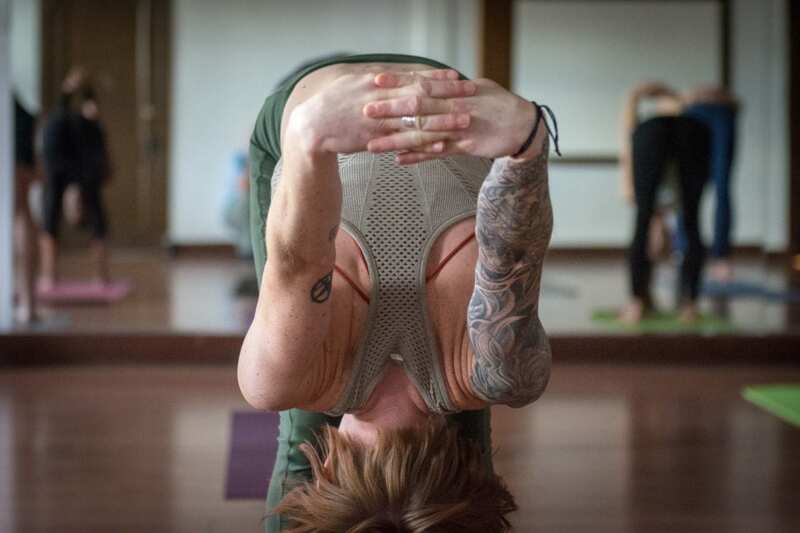 Come find out more about Axis Yoga’s upcoming 300-hour yoga teacher training. This will be a great opportunity to experience a class, meet graduates, get your questions answered and get a taste of what Axis is all about! Click here to RSVP and invite your friends!